Usually, for three days before each auction, there is a preview where the entire contents of the auction is on display. Do your research and ask questions to make sure you understand what you are bidding on. One of our staff is available to answer questions about any lot. For our Specialty Auctions use your catalogue when examining items to record comments and the lot numbers you may be interested in bidding on! Bidding is easy, exciting and fun! If attending the auction it is important to arrive on time. One of our staff will gladly estimate at what time a particular lot may be sold. If you are unable to attend, you may bid via an absentee bid. the Auctioneer will bid on your behalf, not exceeding your bid over the floor bid. Our office must have your absentee bid no later then 24 hours before the auction. 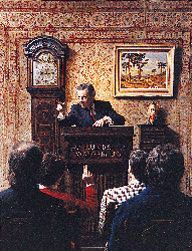 The Auctioneer will open the bidding at approximately one quarter to one half of what he feels the item may sell for. At any point, if you would like to place a bid, just raise your hand. Once the bidding is finished, the Auctioneer will ask for the initials of the successful bidder. If you do not hear your initials then the lot is not yours. You must make a dispute before the next lot number is announced. It is your responsibility to make sure the Auctioneer sees your intent to bid - don't be shy, it's easy to bid. Successful absentee bidders are notified by phone the day after the auction. As at any major Auction House successful bidders pay a BUYER'S PREMIUM, ours is 20%. This is added to the final bid price, along with any applicable tax. Payment may be made at the Auction or the next day by cash, cheque or money order. When consigning items for auction, it is important you know what the likely selling price may be. Bring your items to our showrooms. One of our staff will be happy to examine them. Lunds holds Antique & Art, Collectible, and weekly household auctions. We will advise you at what type of auction your items will obtain maximum selling price. Mail photographs of items, if you prefer. Include as much information about the articles as possible and we will send you an estimate. For your convenience, arrangements can be made for our appraisers to examine items in your home. Lunds can arrange to sell all saleable merchandise. As soon as we receive your items for sale, you will be issued a receipt with an owner number, then lot numbers are assigned; articles may be grouped to form one lot for better saleability. Your items will be assigned for an Antique & Fine Art, Collectible, or weekly Household Auction. Quick settlements with detailed statements 8 days following auctions. Auction procedures allow a minimum acceptable price below which your property will not be sold. This reserve price is established by the seller in consultation with our staff prior to consignment. If the bidding does not meet the reserve price, the item will be "bought in" and you may have it returned to you or sold in another auction without reserve. Your items are exposed during preview hours to a strong base of buyers. We have an extensive international network of interested collectors and dealers whom we notify of specialized items. Buyers have traveled from London, New York and Los Angeles to attend our auctions. Lunds Auctions are an open forum where buyers and sellers of Fine Art, Antiques, Collectibles, and regular household items obtain True Market Value through competitive bidding. contact LUND'S Auctioneers and Appraisers Ltd.